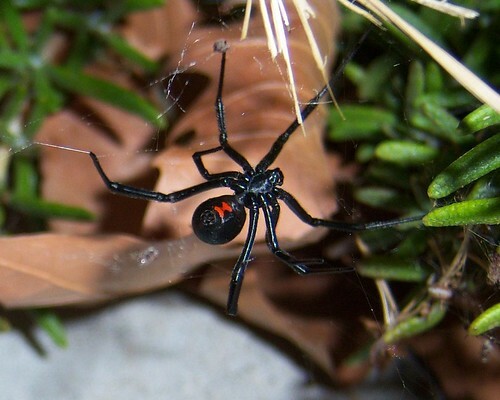 The Black Widow, Lactrodectus mactans is the species found al over the United States and perhaps the most easily recognized of the Lactrodectus spiders. The Black Widow’s venom is a neurotoxin. Meaning it effects your nervous system. Common symptoms are headaches, seizures, vomiting, muscle cramps and at its worse, paralysis. Being a powerful venom it’s also 15 times more toxic than a rattlesnake. However, bites from the Widow are not common. As with many venoms, children and elderly are more prone to side effects than anyone. When bitten, it can take more than an hour to notice pain from a bite. Often the signs are little and seem insignificant, as headaches are usually one of the first signs. A stabbing pain in the bite location may also occur within hours. You may be thinking, “How do I know I was bitten, if I never saw the spider?”. In my last article, talking about the Brown Recluse, I mentioned it was a very hard bite to identify. However the Widow’s bite mark is quite easily identifiable once swelling sets in. It almost always has two little fang marks or “dot marks”, where the bite occurred. No, this does not mean they have huge fangs. In fact, majority of people who have been bitten by the Widow reported not ever feeling the bite at all. It simply is just the swelling of the tissue expanding the bite area, making the bite more visible. The good news is these spiders are very easy to avoid, if you are being aware of your surroundings. They love dark moist environments. This is why many basements will be crawling with Black Widow’s. They also love wood piles, but not like the recluse. Brown Recluses like dry habitats. So while you may find a recluse is a pile of wood for your fireplace, you are more likely to find a Widow in fallen branches and wood piles out in the yard. These carry a lot of moisture and provide a dark comfortable living space for these little creatures. So always wear gloves when working in your yard. They build webs off the ground, and prefer to be in a corners. These spiders are known for their cobweb like webs. When you first glance at a Widow’s web, you may wonder how in the world if stays in tact, and you may also wonder how she makes her way through the web without getting entangled. First of all, the web is said to be stronger than the strongest steel, from a size to strength ratio. So while it may look like a jumbled mess, it actually serves a purpose. When an animal or large insect comes into contact with the web, it doesn’t budge. Everything stays in place. It’s an amazing design the Widow family has developed. The silk they produce is very strong and many scientists are researching it to see what resources we could gain from it. When looking closely into a Widow’s web, you will also see hundreds of silky lines going in and out in every single direction. This gives her and her eggs the ultimate protection against predators and other hazards. The B.W spider is black and shiny. Her legs are pointed at the ends supported by microscopic hairs that help her sense prey and aid her when weaving through her web. She is graceful and truly fast. Don’t let her reclusiveness and jumbled web fool you. She can be at one end of her web and in a split second especially to defend her home and her eggs. The females reach up to 9 mm, with the underside of their abdomen (second section of their body) showcasing a large red hour-glass shape as seen in the picture. In the animal world bright colors such as reds and yellows spell out danger and toxin. As you can imagine, they have few predators. So while she lays in her web, she hangs right side up, presenting the hourglass for everyone to see. Interestingly the male widow looks nothing like the female. He is typically brown in coloration and very tiny. About 1 mm. He is completely harmless so no need to be frightened, his sole purpose is to mate. The Black Widow is known as the widow because she eats her male “companion”. In order to produce offspring she needs to mate with a male. Watching widows mate is an interesting site. The male usually seeks the female. His only purpose in life is to mate and create offspring, hopefully living afterwards. He must be smart and sneaky to stay safe. When entering the web, he must make it clear he is not prey. In other words, let her know he wants to mate. He will showcase this in the way he climbs in her web and approaches her. He soon reaches her and must position himself to to mate. Sadly for him, this means putting his abdomen (extremely vulnerable area holding all the vital organs), directly under her fangs. At any moment she can bite down on him, so he must be quick and efficient. Once he has mated he may leave, however the female usually makes the decision to eat him before he can escape. She will lay around 10 egg sacs in one season, carrying hundreds of babies in each. After about 25-30 days they will hatch out. Until the baby has become a mature female, they do not have any potent venom. You can seek medical attention but anti-venom will rarely be given, as it is more dangerous than the actual widow bite. They usually will help you with the pain and symptoms. Do not kill spider, if you know it bit you. Rather safely catch and it take it with you to the doctor so you can identify it correctly. This is a beautiful species. There are a few other species of Widow spiders throughout the world. Most of which are in the United States. Remember, although highly toxic, these spiders will leave you completely alone unless you come into contact with their web. They are quite gentle spider if not threatened. So feel free to sit next to their web and observe them. You may walk away with a completely different view of this graceful species. Ciara, what an awesome article! I look forward to reading more of your work. I have heard that scientists are researching web for various reasons one I heard of was for bullet proof vests! Have you heard of this? I have not I will look into today!!! Thats extremely interesting and I don’t doub its so strong! !